All services below are FREE with your Ames Free Library card, and titles are automatically returned at the end of the lending period - meaning no late fees, ever! A new, easy to use service from Overdrive! Through the Libby app, you can download eBooks, audiobooks, and magazines. Libby is available for Android, iOS (iPhone/iPad/iPod touch), and Windows 10. For an introduction and instructions on using Libby, visit our Tutorials page. eBooks, audiobooks, and magazines are available through the Overdrive app! Browse through our Overdrive page to see what is available through the Ames Free Library. Overdrive is available for Android, Chromebooks, iOS, Fire tablets, or Windows 8/10. For an introduction and instructions on using Overdrive, visit our Tutorials page. 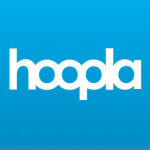 Register for a Hoopla account on hoopladigital.com. This is all you will need to do if you would like to stream digital content directly through your desktop browser. To use Hoopla on your mobile device, after you have registered for a Hoopla account, use your mobile device to download the Hoopla app at the bottom of the Hoopla Digital main page (pick the app store that corresponds to your device). This will allow you to download titles directly to your device for offline playback later, in case wi-fi is not available. For an introduction and instructions on using Hoopla, visit our Tutorials page.